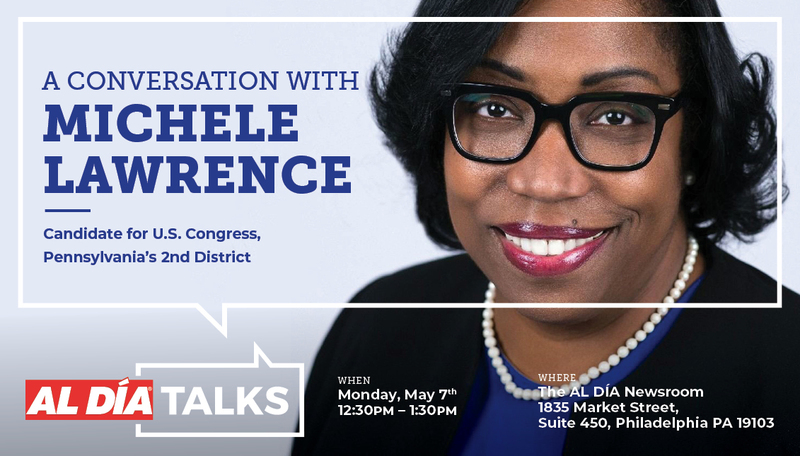 Join AL DÍA Talks for a conversation with Democratic candidate for U.S. Congress, Michele Lawrence. Lawrence is running against Rep. Brendan Boyle to represent the 2nd District of Pennsylvania, which includes communities in North and Northeast Philadelphia. The Pennsylvania primary election takes place on Tuesday, May 15. Lawrence is CEO of MicheleSpeaks, LLC, a company that provides empowerment tools, educational opportunities and strategic planning services to help people build wisdom and wealth. Prior to launching the company in January 2017, Lawrence spent nearly 30 years in the banking industry. She served as Area President and Senior Vice President for Wells Fargo’s Greater Philadelphia Region. To learn more about Lawrence and her campaign, click here.